Amritsar, India, 6 December 2017- The Mayor of London, Sadiq Khan, today called on the UK Government to make a full and formal apology to the people of Amritsar and India for the Jallianwala Bagh massacre. 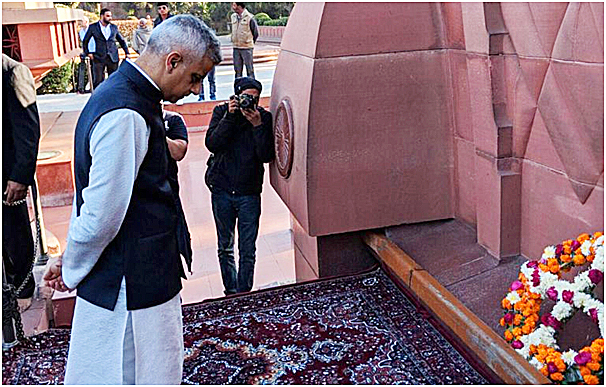 During a visit to the Jallianwala Bagh memorial and garden, the Mayor paid his respects to those who were killed there in 1919, and made it clear that, almost 100 years on from the dreadful event, the British Government should formally apologise on behalf of the British politicians of the time. The British Government has never extended a formal apology for the massacre, which killed hundreds of people and injured many more. The Jallianwala Bagh Massacre is considered to be one of the most tragic events in Indian history. On Sunday 13 April 1919, during the celebration of Vaisakhi, 50 British Indian Army soldiers, commanded by Brigadier-General Reginald Dyer, began shooting at an unarmed gathering of civilians, who were taking part in a peaceful protest. It is thought that 379 people were killed, but the figure is still disputed. The Amritsar massacre was a turning point in Britain’s relationship to India. Until now the Indian National Congress was demanding home rule for India largely through prayers and petitions to the British government. The Jallianwala Bagh incident led, for the first time in India, to a nationwide protest strike. It was led by Mahatma Gandhi. The Indian anger was further fueled by a section of the British public who honoured Gen Dyer, the man who ordered the firing, in a public programme. A year later Mahatma Gandhi launched his famous Non-Cooperation Movement, in which thousands of Indians boycotted the British government by resigning from government jobs, boycotting schools and burning the imported British goods. Sadiq Khan extended his apologies during today’s visit but made it clear that a formal Government apology should have been given decades ago and that, ahead of the centenary of the massacre, it is more important now than ever that the Government properly acknowledges what happened at Jallianwala Bagh to ensure something like this can never happen again. The Mayor of London, Sadiq Khan, said: “The Jallianwala Bagh massacre is one of the most horrific events in Indian history. It is wrong that successive British governments have fallen short of delivering a formal apology to the families of those who were killed. “I’m clear that the Government should now apologise, especially as we reach the centenary of the massacre. This is about properly acknowledging what happened here and giving the people of Amritsar and India the closure they need through a formal apology. At the Jallianwala Bagh memorial and garden, the Mayor met with ancestors of those who escaped the massacre and laid a wreath at the foot of the memorial to pay his respects. The Jallianwala Bagh National Memorial Trust was founded in 1920 to build the memorial at the site. The memorial was inaugurated in 1961 and serves as a way to remember those who died and were injured in the massacre. While in Amritsar, Sadiq Khan also visited Sri Harmandir Sahib, often known as The Golden Temple, which is the most important pilgrimage site of Sikhism. The visit forms part of the Mayor’s six-day mission to India and Pakistan to strengthen their cultural and economic ties with London. Sadiq is the first major British politician to embark on a trade mission to both countries in recent times.